STOP! IT DOESN'T GET ANY BETTER !! The ULTIMATE "in-town"location has ski-in/shuttle out access, with 4 O'Clock Ski Run across the street. The complex is Less than one block from historic Main Street. Having undergone a major exterior remodel, the complex has the feel of a luxury mountain lodge, with its grand log entrances and stone accent exterior.The unit is equipped with its own gas fireplace, balcony, washer/dryer, cover parking and wireless internet. For apre's ski, there are two hot tubs with a fire pit, as well as, easy access to the Upper Village swimming pool and hot tubs. Having completed an interior remodel , this mountain retreat is magnificent! This spacious unit boasts over 1200 square feet of living space all on one level, including two master bedrooms and two baths, a fully equipped kitchen, seperate dining area, and handsome living area complete with gas fireplace and queen sofa sleeper. The look and feel of the unit is absolutely perfect...knotty alder doors and trim thoughout, leather living room furniture, slate accent bedroom furniture, and wildlife decor. 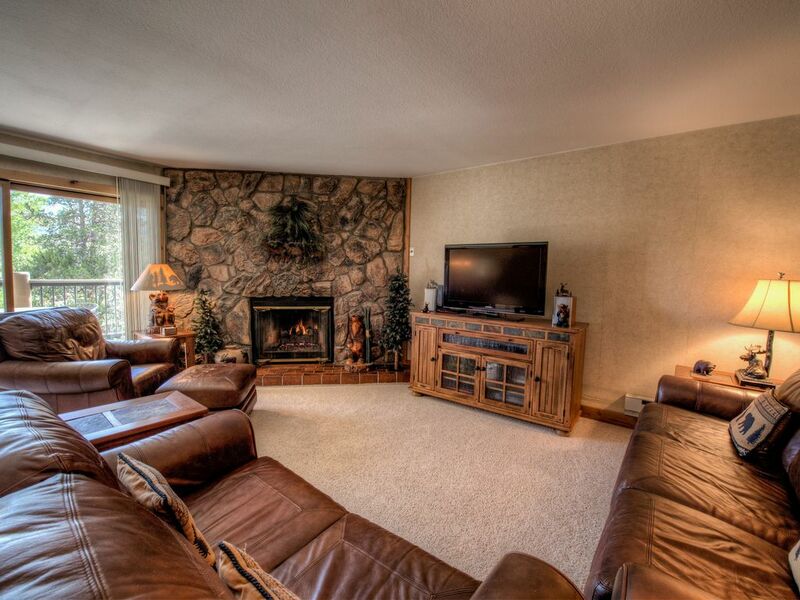 After a day on the slopes, you'll bask in the comforts of this well-appointed haven. You can curl up on the leather furniture in the living area and watch the 40' flat screen TV while enjoying the warmth and ambiance of the gas fireplace. The chef in the group will love the fully-equipped kitchen, and will have no problem whipping up something exquisite on the Jen-Air range/oven or on the gas barbeque on the private balcony(the views of the town are amazing). If no one is volunteering for chef duty, you're only a block from Main Street and its many dining establishments! Later, bedtime will be a real treat, with each master suite, and the sofa-sleeper in the living area, having a flat-screen TV and new mattress. The unit can accomodate up to six people. No bicycles allowed in the Condo. 3 DVD's,Hot Tub or Jacuzzi, Gas BBQ, 3 Cable TVs, Access to heated pool. Cookware, utensils and linens provided. NO SMOKING (of any kind) ! No pets! No skis, snow boards or bicycles allowed inside of unit !! There is a separate lockable closet for skis, snowboards and bicycle storage by the front door.